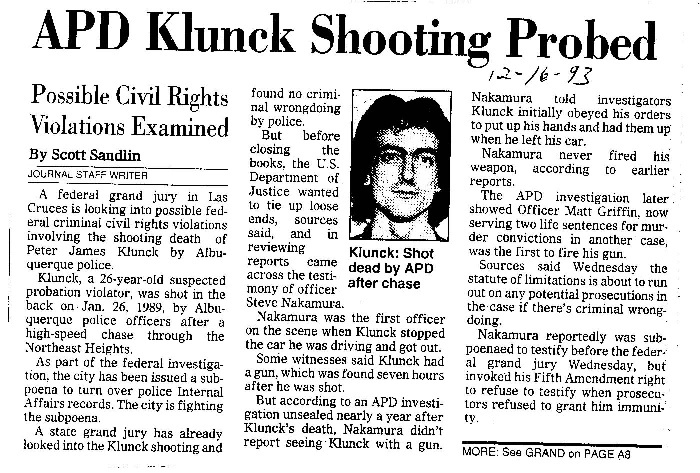 On January 27, 1989, our son, Peter Klunck, 26, was shot to death in Albuquerque by APD Officer Matt Griffin. Two fellow police officers, Officer Robert Valtierra and Sgt. Paul Heatley, also shot Peter. More than one witness to the shooting reported Peter was unarmed. Peter was a small time drug dealer and had been involved in criminal activities with Officer Griffin. A police officer gave a statement to the F.B.I. that he'd been told by a witness that Griffin had Peter pushing speed for him. Then, in October, 1988, Griffin demanded that Peter steal a car for him to use for a bank robbery. This time Peter turned him down. Peter's girlfriend was expecting a baby, and he was getting into rehab and trying to turn his life around. Peter told friends that he was scared he was going to "go down" because he'd refused Griffin, but he didn't want to do that stuff any more. On the day he was killed, Peter was scheduled for an appearance in court at which he told us he planned to "blow the lid off APD." He wouldn't tell us any details because he said it was too dangerous, but he seemed to be mending his fences and tying up loose ends. That morning he called his girlfriend and told her he loved her and if anything happened to him he wanted her to keep the baby. After the shooting, Police Chief Sam Baca issued a statement that Peter was shot in the chest. In reality he was shot three times in the back. The officers at the scene gave conflicting statements: Matt Griffin, whose two bullets were defined as the ones that killed Peter, refused to give a statement at the scene. Officer Valtierra said Peter had a gun in his left hand. Sgt. Heatley said he clearly saw a gun in Peter's right hand. Officer Steve Nakamura, who did not fire at Peter, said Peter was unarmed. "These guys (Griffin, Valtierra and Heatley) shot him in the back, and I don't know why!" he told his sergeant minutes after the shooting. Nakamura stated that Peter followed all instructions and made no threatening gestures of any kind, and two other officers backed him up on that. Because of his continued insistence that he didn't see a gun, Nakamura's supervisors ordered him to undergo psychological testing. After a seven hour search by APD, a 38-caliber derringer turned up 15 feet from Peter's body. Peter's fingerprints were not on it. An honest cop called the Attorney General's office and told them the derringer was an alibi gun planted there by the cops to support Griffin's self defense claim. That cop said APD had intended to mask the whole thing but the coroner's office leaked the information that Peter was shot in the back, not the chest, so that put a crimp in their self-defense claim. In his statement to Internal Affairs, Sergeant Heatley said he didn't fire at Peter until after he'd already been "dropped." Peter was struggling to get up onto his hands and knees, when Heatley says he saw a gun in his hand and shot him under the armpit, and Peter fell on his face. So, how did that gun that was supposedly in Peter's hand when he was lying on his stomach end up fifteen feet from his body without any prints on it? 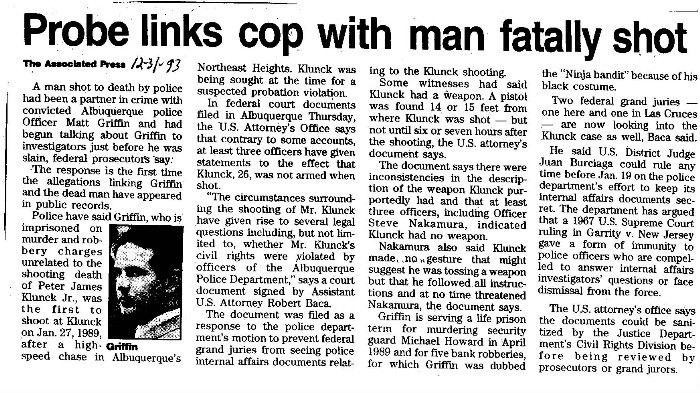 Former Chief Justice Rheardon, who conducted the Internal Affairs investigation, stated in his report, "I believe there is a question about whether Mr. Klunck was armed at the time he was shot and, even if he was, whether it was necessary to shoot him." APD Chief Baca then issued an official statement that the Internal Affairs investigator had concluded that the shooting was justified! 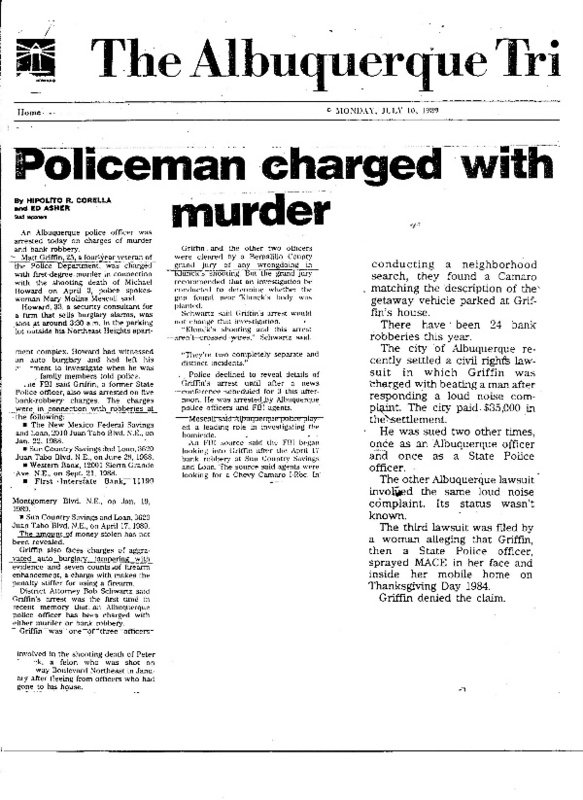 Even when Matt Griffin was later arrested, convicted, and sentenced to life in prison for multiple bank robberies and murder of a witness, law enforcement wouldn't consider the possibility that he intentionally killed Peter. The grand jury was told out-and-out lies, and we weren't allowed to present any evidence to the contrary. We'd had a private investigator on the case from the very beginning, and when he asked for a chance to testify, he was told that wouldn't be allowed because his testimony might "muddy the waters." It took the grand jury, who weren't allowed access to information in the Internal Affairs report, seven minutes to come to the decision that there wasn't any evidence of wrong-doing on the part of the police, but they also stated that they thought the gun might have been planted. That makes no sense at all! If the cops planted a gun to make it look like Peter was shot in self-defense, how can that not be considered wrong doing? In January, 1990, we filed a federal wrongful death and civil rights suit against Police Chief Sam Baca and several police officers. The judge ordered us to settle out of court with no admission that Peter's civil rights had been violated. We took our case to the F.B.I. in Albuquerque. 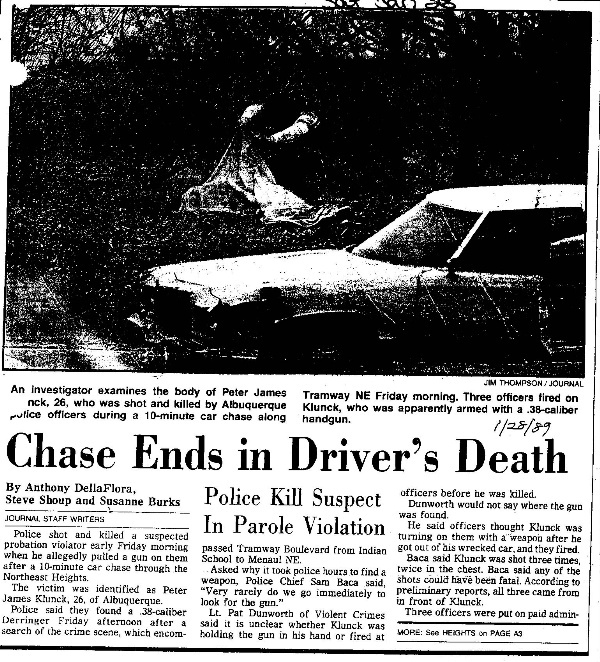 They tried to tell us that federal authorities couldn't become involved unless Peter was killed during a bank robbery. We, then, decided to go over the heads of local agents and had our lawyer write to the F.B.I. in Washington DC. They told us that, yes, of course, the F.B.I. could become involved. The F.B.I. and the US Attorney's office did as thorough an investigation as possible so many years after the shooting, and in 1994 they convened yet another Grand Jury. Although that jury did not exonerate the police, no indictments were handed down. U.S. Attorney John Kelly stated that the federal investigation was inconclusive, with too much conflicting testimony to charge Griffin or any member of the Albuquerque Police Department with criminal conduct. "Even in routine cases, witnesses' perceptions and memories may differ and accurate recollections often fade with time," Kelly said. 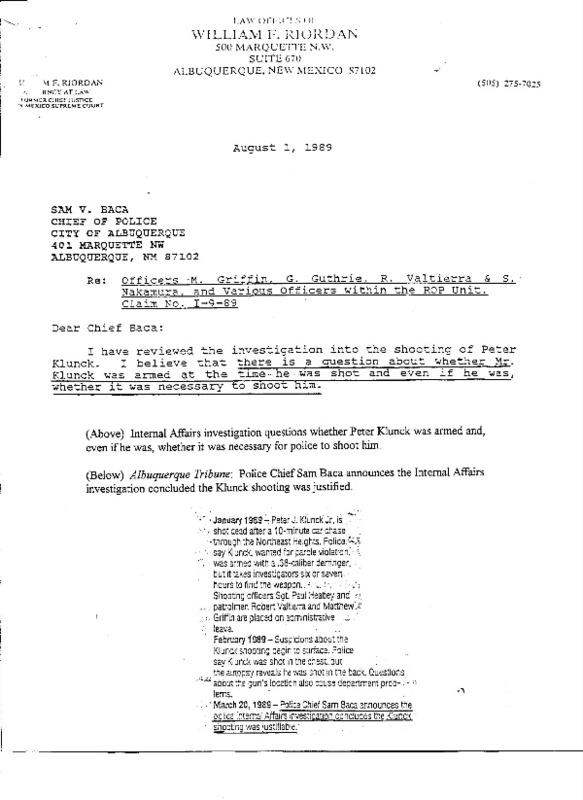 "No one can now say with certainty exactly what happened on the morning of January 27, 1989"
The Klunck family has long believed that Peter was shot by Matt Griffin and two fellow police officers because he was preparing to expose drug activities involving people in influential positions. It now appears their suspicions might be justified. In May 2004, Chief Judge John Brennan of Albuquerque was arrested on narcotics charges. That opened a can of worms that may affect a number of cases on this web site. In June 2004, KRQE TV aired information from a confidential narcotics report about drug activities involving, not only Judge Brennan, but numerous other prominent NM judges, attorneys and members of the state legislature dating back to before Peter was killed. "It draws on a variety of sources and reads like a Who's Who of the New Mexico drug underworld," the reporter said. "Judges, lawyers, politicians, sports celebrities and prominent businessmen appear in the report right along side the State's narcotics kingpins." David Iglesias, US Attorney for New Mexico, called the detailed document about drug smuggling and money laundering in New Mexico "a page-turner I couldn't put down." The Kluncks and other NM families who believe their loved ones were killed because they "knew too much," (Kaitlyn Arquette, Ramona Duran, Stephen Haar, etc. ), are eager to learn the identities of the VIP drug traders whose names are contained in that report. But they have been told that those names cannot be released, because the VIPs have not been arrested.